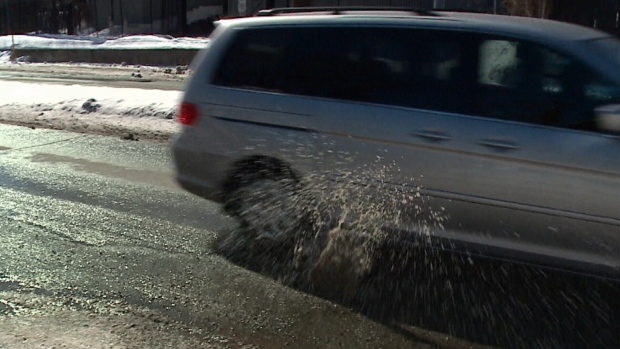 Vehicle hits pothole in Ottawa. Crews are out today filling potholes in anticipation of tomorrow's snowstorm. According to the city of Ottawa, since the start of this year, workers have filled more than 9-thousand potholes, thanks to a crazy season of freeze and thaw. To date this winter season, we've had 76 hours of freezing rain. That's on top of our record snowfall for January. And that takes its toll on our roads and clearly, on our cars. There's the zig and the zag, as cars and trucks try to dodge the city’s numerous potholes. Then there's the full-on air launch, from those who don’t see them in time. But driving takes on a new challenge when you're playing pac man down our city streets. The city says they are doing something about it but the fact is, those same potholes keep “popping up" especially with the winter we’ve had: 216 cm of snow along with 76 hours of freezing rain. Top that off with 35 freeze/thaw cycles, according to statistics from the city of Ottawa. The city says since January, it's already filled 92-hundred potholes. It just doesn't feel that way. It is damage that can cost hundreds of dollars to replace rims or repair suspensions. At least on a day like this, you can see the potholes but come Tuesday or Wednesday, they'll be buried in snow or water, then it's anyone's guess where they are. Some councillors say if it isn't potholes they're dealing with it's ice ruts like these that can also wreck your car. The best advice, says Giaccone, is not to follow too closely behind another vehicle. You know if the car ahead of you takes a significant dip down there's a pothole ahead. Slow down and try to avoid it. Quebec's Public Security Department said as of 2 p.m. Wednesday, about 1,900 homes across the province were flooded and 515 people have been forced to leave.